Motorcycles – All two or three-wheeled motorized vehicles. Typical vehicles in this category have saddle type seats and are steered by handlebars rather than steering wheels. This category includes motorcycles, motor scooters, mopeds, motor-powered bicycles, and three-wheel motorcycles. Passenger Cars – All sedans, coupes, and station wagons manufactured primarily for the purpose of carrying passengers and including those passenger cars pulling recreational or other light trailers. Other Two-Axle, Four-Tire Single Unit Vehicles – All two-axle, four-tire, vehicles, other than passenger cars. Included in this classification are pickups, panels, vans, and other vehicles such as campers, motor homes, ambulances, hearses, carryalls, and minibuses. Other two-axle, four-tire single-unit vehicles pulling recreational or other light trailers are included in this classification. Because automatic vehicle classifiers have difficulty distinguishing class 3 from class 2, these two classes may be combined into class 2. Buses – All vehicles manufactured as traditional passenger-carrying buses with two axles and six tires or three or more axles. This category includes only traditional buses (including school buses) functioning as passenger-carrying vehicles. Modified buses should be considered to be a truck and should be appropriately classified. The term "trailer" includes both semi- and full trailers. Two-Axle, Six-Tire, Single-Unit Trucks – All vehicles on a single frame including trucks, camping and recreational vehicles, motor homes, etc., with two axles and dual rear wheels. Three-Axle Single-Unit Trucks – All vehicles on a single frame including trucks, camping and recreational vehicles, motor homes, etc., with three axles. Four or Fewer Axle Single-Trailer Trucks – All vehicles with four or fewer axles consisting of two units, one of which is a tractor or straight truck power unit. Five-Axle Single-Trailer Trucks – All five-axle vehicles consisting of two units, one of which is a tractor or straight truck power unit. Six or More Axle Single-Trailer Trucks – All vehicles with six or more axles consisting of two units, one of which is a tractor or straight truck power unit. Five or Fewer Axle Multi-Trailer Trucks – All vehicles with five or fewer axles consisting of three or more units, one of which is a tractor or straight truck power unit. Seven or More Axle Multi-Trailer Trucks – All vehicles with seven or more axles consisting of three or more units, one of which is a tractor or straight truck power unit. 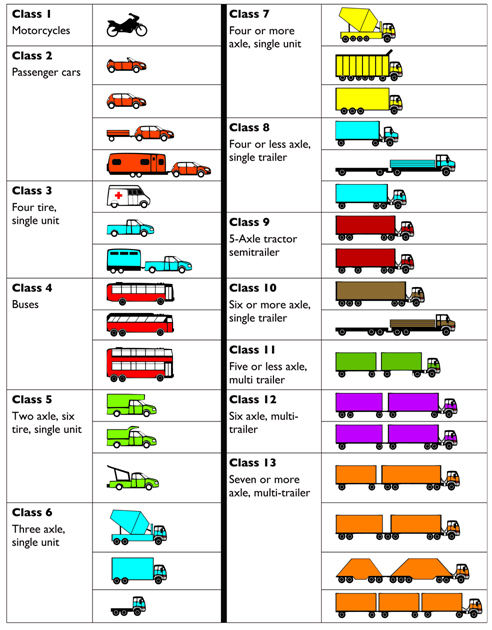 Figure C-1 lists the 13 vehicle category classifications used by FHWA. Certain truck configurations utilize axles that can be lifted when the vehicle is empty or lightly loaded. The position of these axles — sometimes called lift axles, drop axles, or tag axles — affects the classification category into which the vehicle falls. To maintain consistency between visual and axle-based counts, the TMG recommends that only axles that are in the dropped position be considered when classifying the vehicle. While this promotes consistency, it may induce difficulty when interpreting summary classification statistics at certain locations. For example, a site may exhibit directional differences in vehicle classification even though the same trucks may be travelling one direction loaded (with axles down) and the other direction empty (with axles lifted).